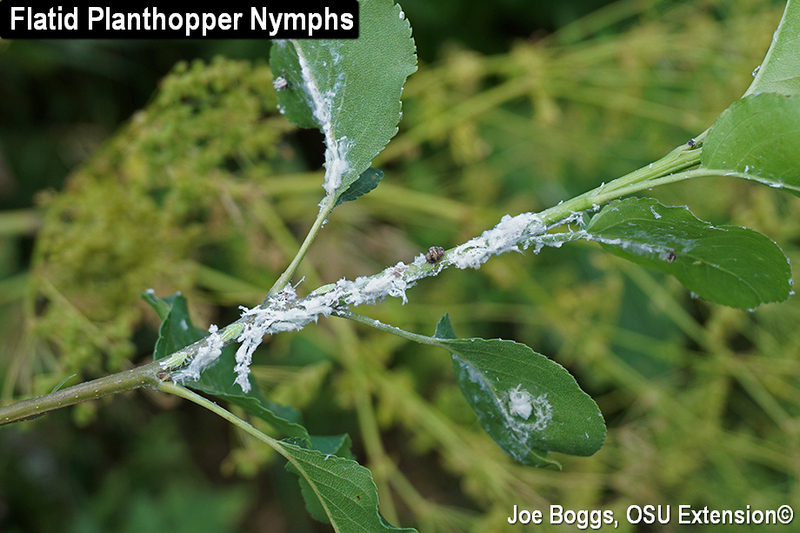 Clusters of fluffy, white flatid planthopper nymphs are appearing on the stems and leaves of low growing plants in southwest Ohio. The planthoppers are most commonly found in woodlands, but will occasionally creep up the stems of plants in landscapes as well as vegetable gardens. Flatid planthoppers are so named because they belong to the family Flatidae (order Hemiptera). There are several species in Ohio, but one of the most common is the Citrus Flatid Planthopper (Metcalfa pruinosa). This planthopper is found throughout the eastern U.S. and ranges from Maine to Florida where true to its common name, it's often found on citrus. Early instar nymphs are often obscured by a dense cloak of tangled waxy, white "fluff." They congregate in groups, or "colonies," and their profusion of flocculent material on plant stems may cause them to be mistaken for woolly aphids. Late instar nymphs look like some form of Star Wars troop vehicle with tufts of white filaments streaming behind. Adults are relatively small insects measuring little more than 1/4" long. They have broadly triangular shaped front wings that are held vertically tent-like over their abdomens. The adults are commonly found resting on plant stems and are sometimes mistaken for moths. Flatid planthoppers are sucking insects and can produce copious quantities of honeydew to become colonized by black sooty molds. They seldom rise above the status of nuisance pests. However, I've been watching an infestation on climbing hydrangea for a number of years and occasionally see damaging populations with the primary impact being reduced foliage due to bud damage and loss of foliage from heavy sap removal. Nymphs can be washed from plant stems using a coarse stream of water from a garden hose which will also wash away the white "fluff." Insecticide applications are seldom warranted, but if needed, insecticidal soap applications are highly effective and will preserve the hopper's natural enemies.